My goal for Saturday was to climb Moose Mountain (3899') in the McKenzie Mountain Wilderness Area. This is a peak on the hundred highest list in New York. 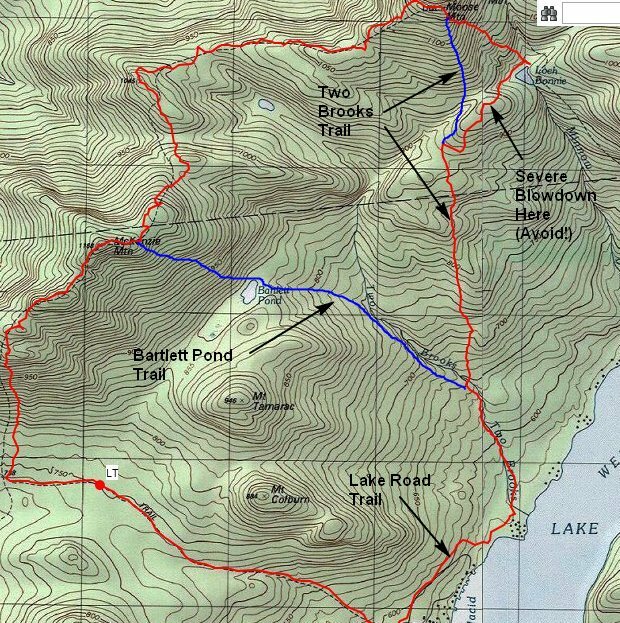 The plan was to park on Whiteface Inn Road, take the Jackrabbit Trail to the McKenzie Mountain Trail, climb McKenzie, then follow the Shore Owners Association (SOA) her﻿d paths in a loop to complete the hike. I had climbed McKenzie (3861) previously on an early November day in winter conditions. Look at the conditions I had that day! I also had climbed Haystack on that day. Haystack is a nice destination on it's own. As I drove to Lake Plaid, I noticed all the trailheads in Keene were absolutely packed, with cars lining the road for great distances. This was another reason to climb at a location outside the High Peaks, even though Moose and McKenzie are darn close to high peaks. My previous trip to McKenzie started from Route 86, so that is why I chose to start this trip from the Jackrabbit Trail on Whiteface Inn Road. This time I was also starting late, 11:15, so I wanted to move quick. It took 30 minutes to walk the 1.8 mile section of the Jackrabbit Trail to the intersection with the McKenzie Trail. There is nothing too exciting about hiking the Jackrabbit in summer, also in winter it is a fine ski trail. At the McKenzie Trail, I turned right, and immediately began the steep climb up McKenzie. From the junction, the trail climbs 1000' feet in the next .7 miles. It then tapers off a little as you go over several false summits. After an hour and 45 minutes of hiking, I was on the summit of McKenzie. While the summit is wooded, there are several viewpoints on the east and west sides of the summit that offer great views. From the summit of McKenzie, I left the people behind and continued north on the SOA herd path to Moose Mountain. Then I was on McKenzie previously, I had turned around shortly after starting on this herd path, due to blowdown and lots of fresh snow. This time the path was wonderful. It has a rugged remote feel and offers hiking on duff instead of rocks, roots and mud. It is 3.1 miles from McKenzie to Moose and this section of the hike took me an hour and 45 minutes. I has now 3.5 hours into the hike. 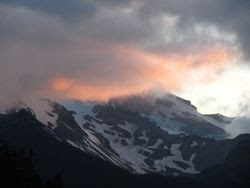 I was quite surprised when I reached the summit of Moose to find 2 young women (perhaps in their early twenties) there. They had climbed from the SOA Two Brooks Trail and said it had taken them three hours. These were the only people I saw once I left McKenzie. Moose Mountain offer 2 viewpoints; one looks over Lake Placid, and the other offers views of Catamount and Whiteface. I sat down with Rev to have some snacks. It was a beautiful day out. Not quite bluebird skies, but nice temps and no humidity. I was surprised but the amount of ordinary house flies buzzing around us on Moose as we ate out snacks. No other bugs bothered us all day. From Moose it was time to complete the loop. We left the summit and quickly came to a fork in the SOA trails. The left fork goes to Loch Bonnie (.5 to Loch Bonnie, then .3 to Two Brooks), the right fork bypasses Loch Bonnie and goes directly to the Two Brooks trail (.6 miles). I chose to go the extra .2 and see Loch Bonnie. The trail to Loch Bonnie is steep smooth duff. Again, no rocks roots or mud, just steep duff. Very unusual for the ADK's. Loch Bonnie is a small quiet tarn. Once there, you reach another trail split; left to Undercliff and the lake, right to go to Two Brooks trail and back to Whiteface Inn Road. Once I made it through the hellacious .3 mile spur, I was on the Two Brooks trail which was delightful. About halfway down, I came across the junction with the Bartlett Pond trail to McKenzie. I haven't taken this trail; something to do in the future. Continuing on, the trail crossed Two Brooks; a nice brook with great spots to soak your feet. You also pass an old stone wall that looks like it was built to channel the brook. I really liked this hike, especially Moose Mountain. I you want a shorter version, you can go in and out on the Two Brooks Trail, or do a loop with Bartlett Pond and Two Brooks (that may be my next version of this hike). I read somewhere that the Lake Trail was closed. Is it open to the public again? Also, are there cascades on Falls Brook? Interesting post as always. Thanks. Yes, the Lake Road is open.